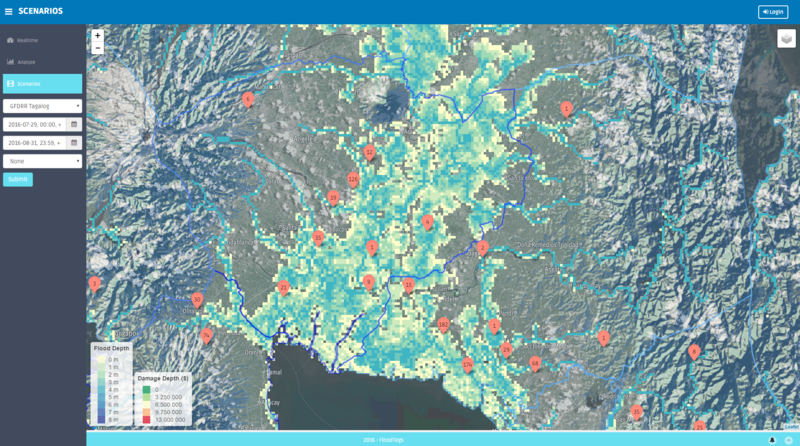 The dashboard for real-time flood information from the media can be used to access FloodTags' data easily on the web (also for mobile devices). Please note that all data and functions that you will find in the Dashboard, are also accessible from the API. There you can find the full suite of Floodtags' functions, and connect to them from within your already existing applications or Dashboards (if you have them). 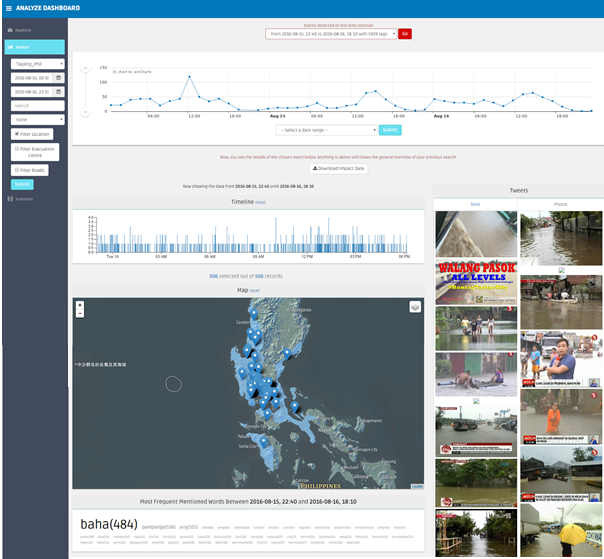 The Dashboard shows what people are saying about floods in the media. This enables you to online monitor new developments related to floods. You will be alerted about new floods happening (in many countries Twitter is the first platform to hold information on new flood events). And you can review new information about those flood events (situational awareness) in real-time. This complements the information obtained from standard reporting protocols, filling their temporal, spatial and sometimes content gaps (once detected, flood and disaster managers usually have a reporting protocol for on-location staff or volunteers). The Dashboard can manage hundreds of thousands of observations at a time. The standard source data of the Dashboard is Twitter. As mentioned in most countries Twitter is the first platform to hold information on new flood events. However the Dashboard can also take in Facebook information, so that posts on public pages can feed into it. And, within soon we will add news media as source data (online news papers and stations). This datasource can be used not only to monitor current updates from local news stations, but also complete histories of flood events can be extracted from those data (sometimes only one news station contains >100.000 documents from which past flood events and their impact can be detected). Such long histories of flood information can among others be used for impact forecasting. This is forecasting of the impact can be expected on the basis of current meteorologic and hydrologic conditions. Visual overlay of external data in the Dashboard. Please note that the prime function of the Dashboard is to show online media, but on Client request we provided a plugin to show additional information in the same view. Set-up of your Dashboard: Including which sources would you like access to, which filters need to be available and would you like to receive an alert email when new events are detected. Train a new classifier: In a process of display and annotation of tweets, a new NLP classifier can be trained and applied to filter the source data. For more specific information on the functions of the Dashboard we refer to the tooltips that come with the Dashboard. They guide the user through the full array of functions.